How do I use the TreasurePoints Rewards program? Do I have a store credit? Do I have any rewards points or rewards? What is the difference between a coupon and a store credit? To log in from any page on the site, look all the way up to the top right. If you've forgotten your password, resetting it is easy. Click here: Treasured Locks Login Page. Underneath the sign in there is a link that says "Forgot Your Password". Click there, enter your email address, and wait for the password reset email. If you have any problems, please contact us. What is the TreasuredPoints Rewards program? The most common way to get a coupon is by subscribing to our newsletter or signing up for our VIP text list. We periodically send coupons out to people on those lists. If you want coupons, please make sure you stay subscribed. You may also have received a coupon via our TreasurePoints rewards program, if you referred a friend to us or if you are friend who was referred to us. To get store credits, make sure you're enrolled in our TreasurePoints rewards program. Shop as you normally would and make sure you have the coupon code with you. Once you're on the checkout pages, you'll see you order total and a blue link that says Promo/Gift Certificate. Click that link to open the box where you will enter your coupon code. Please don't check out until you see the coupon has worked. Please note the coupon code must be entered exactly. Upper case and lower case counts. It's best to cut and paste the coupon code for accuracy. Contact us if you have any problems. How do I know if I have a store credit? Log in (see the "How do I login video if you have problems with this). Once you are logged in, if you have a store credit, it will show right next to "My Account" at the top of the screen. First make sure you are signed in. You cannot use a store credit until you are logged in. Once you are at the payent part of the checkout (after choosing your shipping method), you will see the store credit right below "Payment Method"
The box to apply the store credit should be checked. Please be certain it remains checked. Do I have any reward points? To check on your reward points, first log in to the system. Then, locate the green TreasurePoints button at the bottom left of your screen. If you click on that button, you will see your reward points totals, what rewards you are eligible for, and how you can refer your friends and receive rewards for them and for you. In late 2017, we changed our rewards program. Your old points should have transferred over. If you think there is any discrepancy, please let us know and we will make it right. How do I earn TreasurePoints? 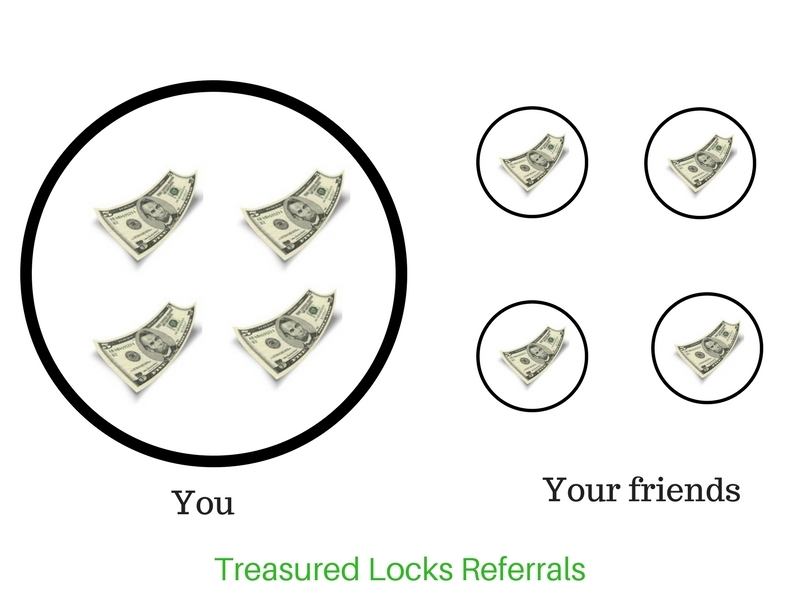 Our referral program pays you and your friends when you tell your friends about Treasured Locks and they make their first purchase. For every friend you refer to Treasured Locks and makes a purchase, we will give you a $5.00 coupon and give your friend $5.00 off of their first purchase. To start making referrals, sign into the rewards program and click on the green button at the lower left of each page on our site. Scroll down to find the referral section. The first tab on the login screen you will see is "Orders". To find the status of your order, first log in, locate your order, the status will be there. Typically, through the TreasurePoints Reward Program, you will receive store credit to be used on your next purchase. Store credits can be combined with coupons. Store credits do not expire. Store credits don't require any coupon codes, they are strored with your account. A coupon code is typically received through a promotional communication such as an email or a text from us. Coupons cannot be combined with each other (stacked). Coupons typically have expiration dates. The coupon code must be entered to apply to your order. Coupons are issued through the TreasurePoints Rewards Program, for referrals. There are many ways to earn rewards points. Following are the most common. You can also get a personalized link that you can share with your friends and be rewarded when they place their first orders.